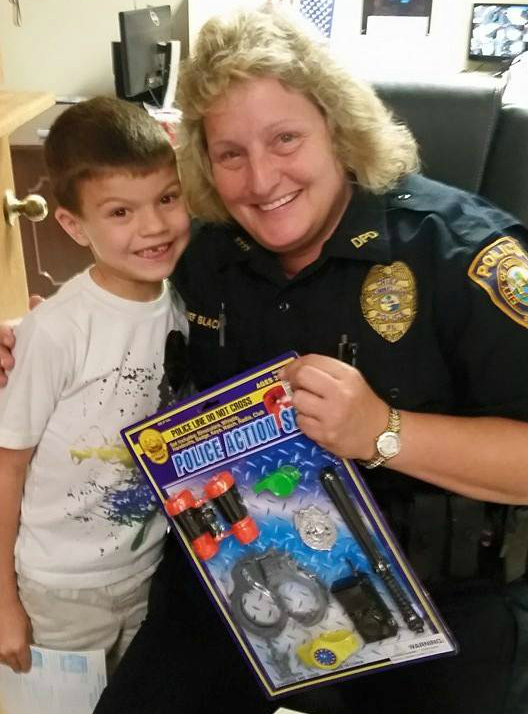 Dunnellon Police chief Joanne Black gives a toy Police Action Set to a young boy visiting the police station. Dunnellon, Florida — Dunnellon Police Chief Joanne Black has resigned her position as police chief of the Dunnellon Police Department. City Manager Eddie Esch Sr. said Chief Black’s resignation was for personal reasons. According to a press release, the letter of resignation was effective for May 11, 2015. Esch requested that the Marion County Sheriff’s Office provide temporary leadership for the Dunnellon Police Department during this time of transition. Sheriff Chris Blair agreed to the request to assist the DPD. According to reports, Lieutenant Brian Spivey was appointed by Sheriff Chris Blair to assume the post of interim Police Chief, but would remain an employee of the MCSO. Lieutenant Brian Dotten was appointed by the sheriff to assume Lieutenant Spivey’s duties as the Lieutenant overseeing the Tactical Investigations Unit and the Fugitive Apprehension Unit. This is in addition to his continued responsibilities in supervising the Property Crimes Unit. “The Dunnellon Police Department and the Marion County Sheriff’s Office have been partners in law enforcement and will continue to work with the city to provide law enforcement services until such time a decision can be made by Dunnellon city officials for the best interests of all involved,” Sheriff Blair said.